The idea is that with referees calling every foul, the players will stop making them. Tune into any college basketball game over the opening weekend and one thing was clear: there certainly were plenty of whistles. 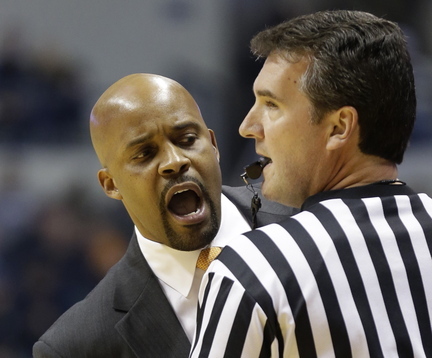 The NCAA made a major push in the offseason to have officials enforce rules more tightly this year. The goal is to improve scoring by increasing the freedom of movement and reducing physical play. It’s working so far, as points are up — and so are fouls. Both men’s and women’s games averaged nearly an identical 42 fouls a game in the first few days according to STATS. That’s seven more than last season for the men and 10 for the women. The ninth-ranked Orange and Fordham combined for 55 fouls and 72 free throws on Tuesday night. Kansas coach Bill Self agreed with James. “Obviously there’s a lot of fouls and no rhythm,” he said after his fifth-ranked Jayhawks beat No. 4 Duke 94-83. “I believe the first game was a lot like that, too, at least in the second half. To be honest, I don’t like it, but hopefully players will learn to adjust and coaches will do a better job. It just takes away all aggressiveness defensively. At least it does with us. We haven’t had a team shoot 50 percent against us, maybe five times in the last seven years. There were 53 fouls and 63 free throws taken in the game. In top-ranked UConn’s 19-point win over No. 3 Stanford on Monday night there were 40 fouls called. The worst offenders — or in this case defenders — came at the Niagara-Seton Hall men’s game on Saturday. The two teams combined for 73 fouls and 102 free throws. At the Morehead State-Libscomb women’s game Sunday, the two teams combined for 64 fouls and the game took nearly 2 1/2 hours. There were 90 free throws taken in that game which Morehead State won 82-77. On the other end of the spectrum, Villanova and Mississippi Valley State combined for just 18 fouls on Saturday. The game wrapped up in a tidy 1:28. Scoring peaked at 70.7 points for the women in 1982-83 and has been on a steady decline ever since. The points of emphasis seem to be working early as points are up. Teams are averaging just over 70 points, which is eight more than last season’s record low and the highest since the 1990-91 season. Men’s teams are averaging 76.0 points through the first few days, an increase from last season’s 67.5 — which was the lowest in men’s basketball since 1952. Even with the increase in fouls, not everything has been caught. In the Georgetown-Richmond game Friday, freshman Shayla Cooper lost her shoe early in the second half and tried to block a Spiders’ 3-pointer by throwing the sneaker at the ball. She missed and so did the officials, who didn’t call a foul on the play. Or even a “soletending” violation.